Shri Arun Jaitley, Minister of Information & Broadcasting, Finance and Corporate Affairs has said that the print media needed to accept the challenges put forth by the Digital and Information age. The internet revolution and fast changing technology presented a big challenge to the Print Media across the world to maintain its presence and sustained growth. However, India remained an exception wherein Print Media registered growth owing to an increasing demand and subscriber base for Regional Newspapers. The Minister stated this while releasing the 59th Annual Report on Print Media- “Press in India 2014-15” prepared and compiled by Registrar of Newspapers for India here today. Col. Rajyavardhan Rathore, Minister of State for Information & Broadcasting was also present during the event. Elaborating further, Shri Jaitley said that Print Media had to contend with the information flow disseminating from electronic media which weakened the dividing line between news and opinion. The emerging viewpoint had brought a certain shrillness in the debates and discussions. Print Media, thus, had a role to play in maintaining objectivity and preserving the sacred nature of news. It was important to also understand that emerging viewpoints surfaced due to the vastness of the media universe where different perspectives were put forth on a given issue. The Minister also said that it was time for the Magazine Journalism to reinvent itself since the options for the readers were expanding due to alternatives such as Digital and Social Media. Shri Arun Jaitley further said that the worldwide trends show that many popular magazines had shifted to the online digital edition, since it’s time for instantaneous news with fast changing world, news and technology. Hence, the shelf life for news being collated in magazines was considered outdated. 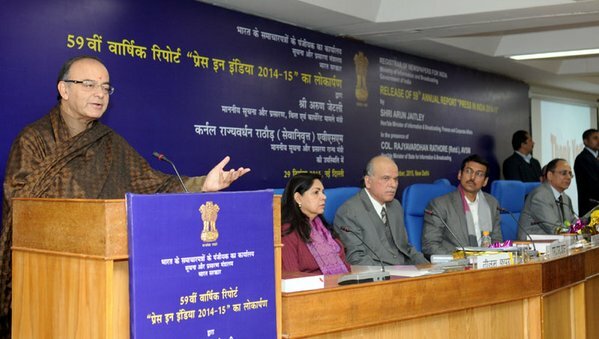 Special Secretary, Shri J. S. Mathur in his address gave an overview of the publication and highlighted the journey of Press through history. He also touched upon the changes being brought forth in the media space, especially the Print Media. The Annual Report “Press in India- 2014-15” was prepared on the basis of analysis of annual statements filed by the registered publications. The registered publications were required to file Annual Statements giving details including circulation figures under the Press & Registration of Books Act 1867. The report provided broad analysis of the general trend of the Indian Press based on the claimed circulation. The print media registered a growth of 5.80% over the previous year as a total of 5,817 new publications were registered during 2014- 15 and 34 publications ceased their operation. Out of the total 1,05,443 publications registered as on 31st March, 2015, the largest number of newspapers and periodicals registered in any Indian language was in Hindi with a figure of 42,493 publications followed by English with 13,661 registered publications. Out of 1,05,443 registered publications, 14,984 were dailies and bi-tri weeklies and remaining 90,459 were of other periodicities. State-wise analysis shows that Uttar Pradesh with 16,130 publications was at top position at the end of 2014-15. Maharashtra with 14,394 publications and Delhi with 12,177 publications were at second and third position respectively. Total claimed circulation of publications stood at 51, 05, 21,445 in 2014-15 as against 45, 05, 86,212 copies per publishing day in 2013-14. The number of Annual statements received in RNI for the year 2014- 15 was 23,394 against 19,755 in 2013-14 registering an increase of 18.42%. As per report, circulation-wise, Hindi Publications continued to lead with 25,77,61,985 copies per publishing day followed by English with 6,26,62,670 copies and Urdu with 4,12,73,949 copies per publishing day. The report also carried different Chapters viz. ownership of newspapers, analysis of daily newspapers, language wise study of the press and analysis of registered newspapers.